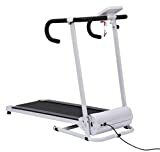 This effective machine is helpful to keep body shape and achieve fitness through convenient home exercise . A walk or run on it could burn extra calories with ease in your favourite way. It is foldable and adjustable , storage is easy. Safety lock and scram function is designed for security. All operation is normal and stable without obvious shake and noise.